Louis and his companion FC are two inhabitants of a simple hamlet. Louis hungers for adventure and this tale follows his attempts to live his dreams. Designed to frighten and amuse children of all ages, this scary-cute story will make you laugh and cry. 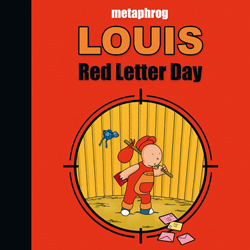 The multiple Eisner and Ignatz awards nominee Louis – Red Letter Day has had a makeover and is now back in print, in an entirely redrawn and repainted edition with beautiful hand-painted artwork, packaged in an attractive hardback. A stand-alone story complete with a making of section. It’s brilliant… it’s funny, it’s weird… Kids are going to LOVE it! 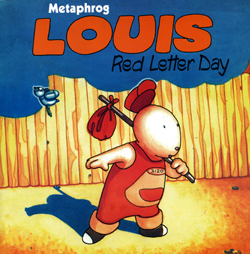 A delightful all-ages tale of Louis’ quest for adventure, Red Letter Day is the sort of comic book that draws you into its world. It’s a distinctive work, fully envisioned and not in the least imitative, and has the potential of becoming a children’s classic. A deliberate blend of delightful and disturbing. 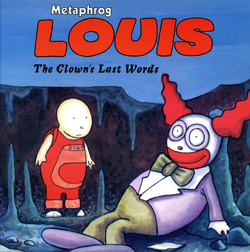 Highly acclaimed Metaphrog return with a brand new stand-alone graphic novel: the moving tale of Louis’ quest for a cure to save his friend FC. A simple story of friendship, heart-warming and genuinely transporting. Beautiful hand-painted artwork packaged in an attractive hardback. Deceptively simple tales that manage to pierce directly to the heart of the human condition. A dream-quest theme persists throughout this colorful book, which brings to mind many classic, if somewhat less unsettling, adventures: Harold and the Purple Crayon and Where the Wild Things Are. Established fans will delight in this volume; like Louis, new readers will enter the story perplexed but exit with joy. A sweet, sad fable, beautifully rendered […] the story they tell, a gentle fantasy, has an easy tone and a deceptive depth that will appeal to both adults and children. These days we’re bombarded with animations or graphic novels that claim to amuse kids while offering a metanarrative to please adults. But few actually fulfil these promises as effectively as this Scottish duo’s hand-painted book. 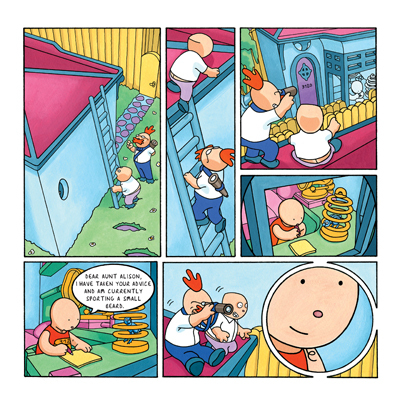 In the tradition of Little Nemo […] Metaphrog have brought forward a fanciful adventure story […] Older readers will pick up on fascinating undertones as John and Sandra define a world where fruit must be assembled and all suburban houses are identical. If you love the unusual and delight in the unique, I highly recommend this title as a candy-colored touch of joy for your library. Did you ever have a really strange dream as a kid? Do you remember being bewildered and intrigued, waking up in a fog of vibrant colors and delightful absurdity? Did you like that dream? 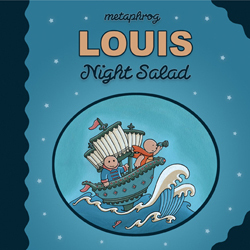 Then Louis Night Salad is for you. When Louis and FC decide to visit Aunt Alison, little do they realise what dangers lurk in Hamlet’s labyrinthine pathways. The odious Fly Catchers are never far behind and a genuine adventure story unfolds. An exploration of our modern lives; a voyage of discovery. Hey and Múm, have each created something magical with music. Shimmering, fragmented melodious sounds, beautifully atmospheric, strangely insistent. These tracks will make your spirits soar. 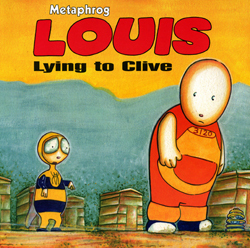 Quite a while ago, Metaphrog from Glasgow were very much into designing their first Louis stories. One special day some rare vinyl by Hey from Berlin drifted to their music loving shores. They sent heart breaking comic books in return. Hey and Metaphrog got to know each other a little. After a while they found it was time to share a story, drawings and music and searched for somebody special to join. They were looking for a long time. Then, finally, Múm from iceland were on the right spot just before heading off to an amazing round camping trip. Friends were made, parcels were sent overseas. An indispensable bedside book, to plunge into as in a dream. 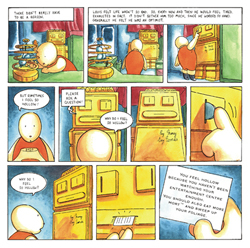 Metaphrog’s deep story will have readers contemplating its images and events long after they’ve reached the final page. Metaphrog give their work the feel of a great children’s book. 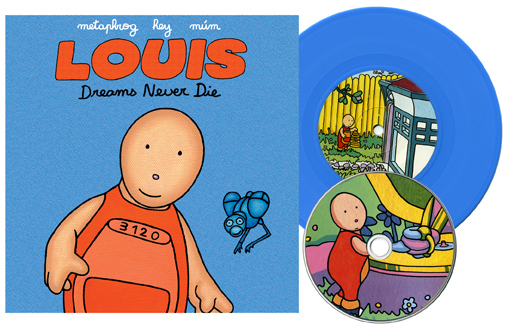 Louis himself is cut from the same cloth as Charlie Brown and Jimmy Corrigan. Back in Hamlet, where the Quidnuncs are up to no good as usual, Louis finds himself working with fruit. Everyone is looking forward to the Fun Day Out, but something sinister is definitely going on. Cheese, clowns and crazy carrots for all ages! 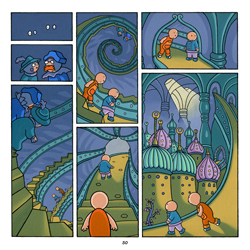 First graphic novel ever funded by the Scottish Arts Council. Metaphrog has crafted something unique, uncompromising, and greater than the sum of its parts. If only more comics were so genuinely transporting. 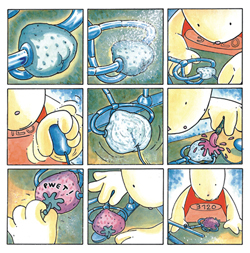 Metaphrog have produced three books about the most adorable character. Life on the bee farm is hard. But, Louis soon finds himself embroiled in a world of mystery and adventure.What is the secret of The Hive? Why would anyone be Lying to Clive? Luminescent and haunting illustrations add to the surreal feel of a magical modernist mystery with implicit 1984-style warning which repays repeated readings. 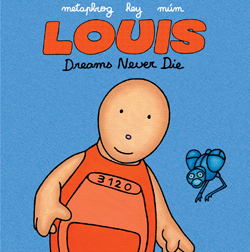 Ostensibly a children’s cartoon book, its subtle humour and sinister quality will appeal to all ages, while unassuming, slightly melancholic hero, Louis, is just totally heartwarming. Beware: this stuff is probably addictive. An insinuating, multi-levelled fable for our disconnected age. With squibs for eyes and delicately inked circles for nose and mouth, Louis’ reduced features magically express a life spent daydreaming, writing letters to possibly fictional aunts and reading signs that say ‘you look like a potato’. Infused with shadowless light and written in precisely elusive balloons, Louis – Red Letter Day is a seriously spaced enigma from Metaphrog aka Glaswegian cult artists John Chalmers and Sandra Marrs. Like nothing else around.